AdvancedMD has also developed a fully integrated, single-database, cloud-based solution that they market as The Power of One: EHR + PM to help achieve what they call Medical Practice Optimization (MPO). If you've been exploring medical practice software online, you've probably seen their ads (they're all over the place) featuring patients talking about how they wish their doctor were using the cloud. Patient Encounter: All clinical info under physician control. HealthWatcher: Helps use best practices to get patients to follow advice via auto-alerts. Physician Dashboard: Customized view of what you need to see most. Specialty Templates: Hundred of templates by practice specialty. Template Library: Lets you preview and choose notes/subnotes templates that fit you. ePrescribing: Paperless management of patient medications. Test Results and Orders: Results attach automatically to patient chart. Patient Population Reporting: Captures patient data from visit notes, verifying patient reporting criteria are met. Interoperability: Communications with patients and referring/consulting physicians. Patient Portal: Secure web-based communications between physician and patients. Quality Reporting: Quality data captured during visit to help with federal incentive documentation; allows for paperless office. Document and Image Management: Including documents, images, audio and video files. 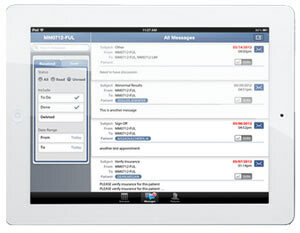 Mobile Access: Access vital patient information and make decisions via iPhone or iPad. E&M Coding: For better accuracy without manual charge entry. Single Sign-on: Easy navigation between EHR and PM sides of practice without reselecting patient. Unified Messaging: Live without sticky notes, phone tag or shouting down hallways. Medical Coding: Management of CPT, ICD & HCPCS code sets, auto-updated in billing system. Payer Rules Maintenance: Helps you keep up with the insurance giants. Rules Compliance: Automatic web-based updates keep all aspects of your practice HIPPA-compliant. Reporting: Powerful and easy to use. Role-based security controls oversee HIPPA-compliant access to records. AdvancedMD is ONC-ATCB-certified. Unfortunately, there isn't a single mention of pricing anywhere on the website. There are quite a few reviews of AdvancedMD on the Internet from users - they paint a picture that is less than perfect. As with some other web-based solutions, reviews highlight the slowness of the system's performance and the poor quality of technical support provided. One review of the billing side of the system noted how easy it is to wipe out entire trails of patient history by accident without any apparent recourse to correct.